"An everyday dish of Middle Eastern origin, simple to make, with a slightly exotic flavor. It isn't fancy, but my family loves it. My husband's father used to make it." Melt the butter in a large skillet over medium heat, and cook the ground beef until evenly brown. Season with allspice, cinnamon, and pepper, and continue cooking 1 minute. Pour in the hot water, season with salt, and place the chicken in the skillet. Cover, and cook 25 minutes, until chicken juices run clear. Remove chicken from skillet, and shred. Return to skillet, and mix in the rice. Cover, and continue cooking 20 minutes, until rice is tender, and liquid has been absorbed. In a separate skillet over medium heat, cook and stir the pine nuts 5 minutes, or until lightly browned. 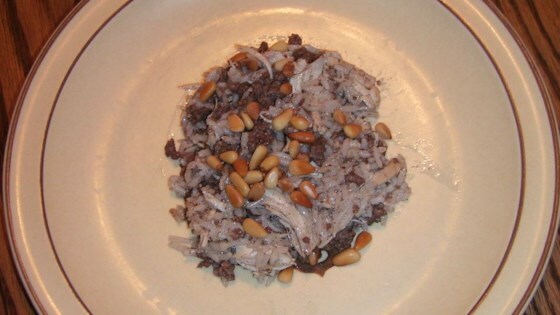 Sprinkle pine nuts over the beef, chicken, and rice mixture to serve. See how to make a super-simple, comforting winter casserole. A nice blend of flavors, but it can be a bit dry. I like this recipe more if I add a handful of raisens. My husband and I found this recipe very easy to prepare and very delicious. The cinnamon in the recipe gave the meal a very unusual combinations of flavors. This was horrible. I had to throw it in the trash and was not able to use it at all.